Bears are amazing creatures. They have a very keen sense of smell and are great opportunists. They eat a wide variety of foods found in nature: fish, berries, plants, seeds and bee hives full of honey. They also forage for people-generated food scraps of all kinds. Because bears hibernate during the winter months, they need to consume large amounts of food in preparation for hibernation in order to nourish their developing offspring. Over the years, bears have become very adept at breaking into unprotected trash cans, dumpsters, garages and homes in search of food. Once they find a reliable source of nourishment, they will return to it consistently. Unfortunately, bears have become more than just a nuisance and now pose a serious problem not only to people’s homes but to the cleanliness of the neighborhood environment. In 1999, we set our sights on developing a practical solution to the bear/trash problem. At that time, homeowners either had wooden trash enclosures in front of their homes or simply set their unprotected trash cans out for collection on their designated pick-up day. Neither of these options deterred the bears from scattering trash everywhere. After rebuilding the wooden enclosure in front of our own home three times, we decided there had to be a better way. Our goal was to develop a bear-proof metal enclosure that would be both attractive and secure and the BearGuard Company® was born. Following a period of initial research and development, we introduced our first BearGuard enclosure in 2000. 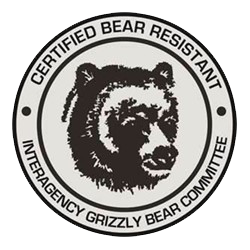 Our enclosure was submitted to the ""Living with Wildlife Foundation" Grizzly Center located near the West Yellowstone National Park for testing in 2004 and was successfully certified “Bear Resistant." Our company employees offer friendly customer service, personal face-to-face contact and offer suggestions as to placement of the enclosure on your property in order to meet your local City and County setback requirements. The BearGuard enclosure uses a tapered key locking latch which has been proved to be bear proof. Some enclosures still use a "Paddle-Handle" type latch requiring the homeowner to reach under a cover plate and push up on a lever to unlock the enclosure. Unfortunately, bears have figured out how to open this kind of door latch by getting their claws underneath the cover guard and pushing on the lever. The BearGuard Company has introduced many unique and innovative features such as our Exclusive Reversible-Hinged door design for either Left or Right opening and our concealed hidden hinge concept. We were the First company to implement an Inside Child Safety Handle preventing child entrapment for homeowner’s liability, and the only company offering a limited Five-Year Warranty. In 2018, we are introducing our 30-Day Satisfaction Guarantee. 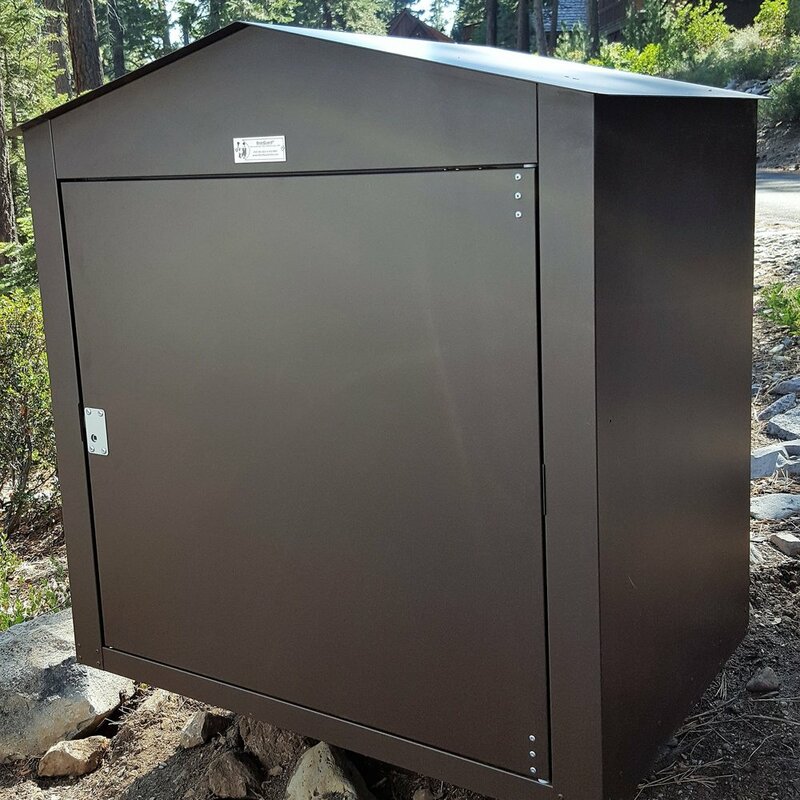 Shown here is our LC-232a enclosure is designed to hold TWO Round 30-GALLON trash cans or ONE Round 32-Gallon and ONE ROUND 30-Gallon trash cans with space inside for a couple recycling bags. 30-GALLON trash cans or ONE Round 32-Gallon and ONE ROUND 30-Gallon trash cans with space inside for a couple recycling bags. Early in 2004, we submitted our enclosure for testing to the "The Living with Wildlife Foundation" Grizzly Center near the West Yellowstone National Park. 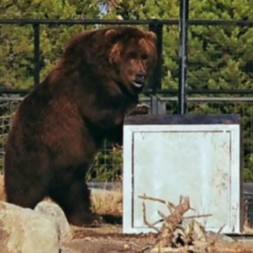 Testing was accomplished using live captive 1250-pound Grizzly bears who attempted to push, claw, or destroy the enclosure to get to the food placed inside. We are proud to say that both of our enclosures passed and received certification on their initial attempt without requiring field modifications. BearGuard enclosures are manufactured using 12 and 14-gauge Galvannealed hot-dipped zinc-coated steel chosen for its EXCELLENT RUST PROTECTION. The galvannealed process provides an excellent surface for our final Powder-Coat finish. Enclosures are manufactured and assembled in one of Northern California's modern-day manufacturing facilities with over 110,000 Sq. 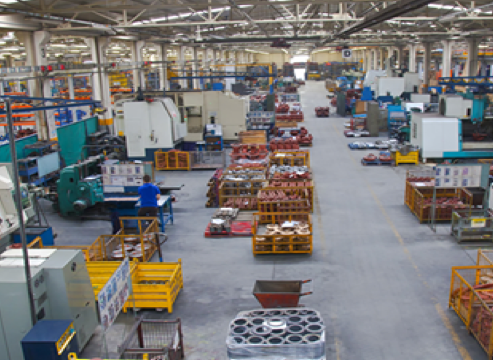 Ft. of manufacturing and fabricating floor space and utilizing the latest automated processes to assure a flawless assembly. Precision assembly is achieved using state of the art CNC laser-cutting machinery for exact dimensions to ensure perfect form, fit and function for final assembly. The steel panels are both riveted and welded for additional strength and precise alignment. The enclosures are then cleaned and prepped for our in-house powder coat finish inside and outside in Cappuccino Satin-Brown finish. BearGuard enclosures offer Architects, Contractors, Condo Owners and Rental Agencies the possibility of replacing expensive commercially- available dumpsters with attractive separate trash enclosures. Our design offers the flexibility of placing the units side-by-side or bolting them together as each enclosure is provided with their own individual pedestal mounting stand. The pedestal stand is anchored in concrete 24-inches below ground level, which allows the enclosure to be mounted 18-inches above ground for year-round access. 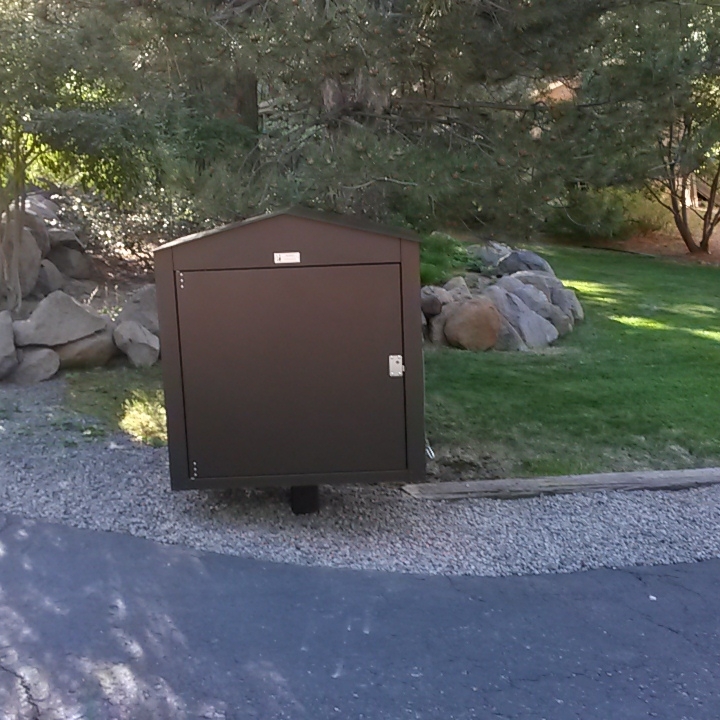 BearGuard enclosures have been proved to be incomparable for securing one's trash cans from bear intrusion.